I’m in the wind up week after a fantastic CPO class, so water chemistry is fresh on my mind. Days of working through math problems focused on all manner of pool issues will do that to you. So, let’s talk about LSI, shall we? I originally sat down to write just one piece about LSI, but I quickly realized that there is just too much to cover for just one post. Instead, we’ll be talking about LSI over three segments: What the LSI is, the mathematical explanation, and how LSI applies to your pool in practical terms. So, what is LSI? LSI stands for Langlier Saturation Index. 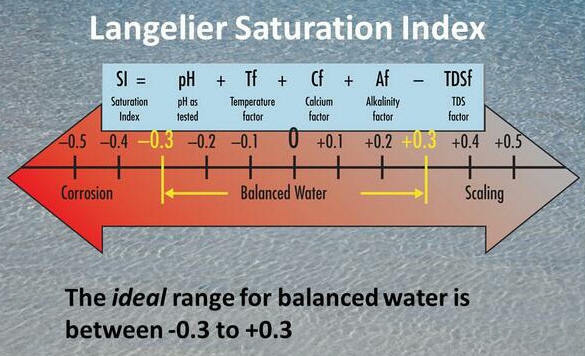 The Langlier Saturation Index is a mathematical equation designed to identify water as balanced, corrosive, or scale forming. Originally, the index was developed by Professor Wilfred Langlier as a method for coating water distribution pipe with a scale layer and essentially quantified the scaling (depositing)/corrosive (eroding) potential of water. The concept was adopted by both the waste water and drinking water industries since it allowed them to control the effect the water had on the sewer pipes and household plumbing. With a few modifications, the LSI equation also quickly became a commercial pool industry standard for maintaining balanced water. By understanding the LSI calculation and how it applies to a pool, a pool operator can quickly identify issues in his or her water and can make proper adjustments. It is important to understand where your pool water falls on the LSI scale because anything other than balanced water has a good potential to be problematic. Water naturally seeks a balanced state, and if you the pool operator do not create that balance, the water itself will attempt to. Corrosive water is just that – corrosive. It is water that is missing something, often calcium, and will take that missing element or elements from the pool structure around it. Corrosive water can erode plaster walls, weaken tile grout, dissolve heater cores, and leave pump motors and metal railings rusty. We’ve seen clients lose heaters after just a year of use due to unbalanced, corrosive water. Scaling water, on the other hand, will do the opposite. Scaling water has more minerals than it needs (again, usually calcium) and will proceed to deposit the unnecessary calcium onto the pool tile, in the heater, and all throughout the plumbing. Scale buildup on tile is simply unsightly and creates more work, since you will find yourself scrubbing the tile far more frequently that you might otherwise. Scale build up in your pipes or heater, though, can be disastrous. Heaters are particularly at risk, since calcium prefers to leave solution in the presence of heat. Calcium build up will significantly shorten the life span of a heater. Along the same lines, chlorine generators will wear out sooner, since they will cake with calcium more frequently and will therefore require more frequent cleaning. When scale begins to coat the inside of plumbing, you’ll encounter reduced flow, increased pressure, and potentially a reduced turn over time. Unbalanced water, both corrosive and scaling, is more likely to be cloudy and more time-consuming. Balanced water tends to be clear and easier to maintain. In short, balanced water – water that has just enough mineral content, total alkalinity, and a comfortable pH – is definitely the water you want to have. So there is an undeniable benefit to understanding LSI and how it applies to your pool water. In the next installment I’ll cover the mathematical formula that makes up the LSi equation, give some examples of how to use the equation to diagnose the current Langlier Saturation Index of a body of water, and go over how to re-balance the equation in order to achieve a balanced index number for your pool. Be sure to check back!